Apparently, after beating the Cavaliers on their visit to Cleveland last night, the Golden State Warriors discovered there was no hot water in the visiting locker rooms. If this was some sort of clever prank by the Cavs, it feels like it’ll be the last time they get the upper hand on Golden State for a while. Cleveland is a hot mess, and it seems this fact is not lost within the locker room. Three different media sources noted “prominent” players voiced their concerns about whether the issues the team is dealing with can be fixed. Said players apparently did this while requesting to remain anonymous. That these players essentially held a private press conference to address these issues is questionable. Their concerns certainly aren’t, though. While the Cavs have been able to dig themselves out of their annual January rut in the past, it’s starting to look like it’ll take a lot more work to do so this time around. Even worse, they might not be properly equipped to do it. The concerns anonymously raised by the players aren’t surprising, mainly because they’ve been around for the bulk of the season. The Cavs are the oldest team in the NBA, and it shows on a nightly basis. This, of course, has helped land them near the bottom of the league in terms of their defensive rating. As anyone who’s followed this team over the past few years knows, this is hardly a new concept. In each of the past three seasons, Cleveland has hit an ugly lull in the early days of the calendar year. This is typically followed by shots being fired within the locker room, either publicly or privately. In each instance, though, the Cavs eventually righted the ship and made their way to the Finals. Many fans are assuming the same result will occur this year, that this just another slump we’ll laugh about come June. While this outcome certainly isn’t out of the question, it really doesn’t feel as though we’re watching another Finals trip in the making. This is mainly due to the fact the issues the Cavs can’t seem to solve right now aren’t likely to disappear anytime soon. Age has been an issue with Cleveland ever since the year started. Many players the team intended to rely on – Dwyane Wade, Derrick Rose, Jose Calderon, Kyle Korver – are on the back end of their respective careers. 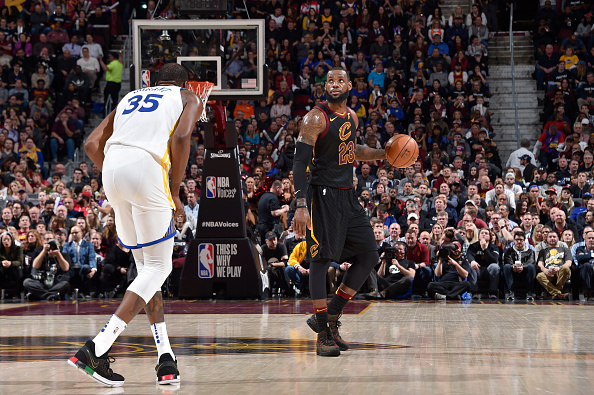 Younger, more athletic teams have been able to run circles around the Cavs, something we saw in the fourth quarter of last night’s loss to the Warriors. Defensively, it’s been bad for most of the season, mainly due to the fact the team as a whole doesn’t have the legs to keep up with anyone. Even during Cleveland’s November surge – when the team won 18 of 19 games – it only held its opponent under 100 points seven times. Many will point to said winning streak as proof this group will eventually get back on track. That said, it’s tough to ignore the fact only four of the teams the Cavs beat in this stretch would make the playoffs if the season ended today. Meanwhile, they’re only 1-6 against teams in the top three of either conference. As you can see, where issues from the previous seasons cropped up out of nowhere, nothing the Cavs are currently enduring is the least bit surprising. It certainly seems as though the players are making this realization themselves. It all helped make last night’s defeat significantly sobering. This Cleveland team simply can’t hang with the Warriors. Barring an absolutely flawless performance, the Cavs can’t beat Golden State once, much less four times in seven games. They aren’t young enough to keep up, and if there’s any team which can blatantly expose Cleveland’s defensive issues, it’s the Warriors. Making matters worse is the fact there doesn’t seem to be a simple fix for this available in the trade market. Cleveland’s lone marquee asset – the unprotected Brooklyn Nets 2018 first-round pick – could certainly net solid returns, but the team is rightfully holding tight to it as insurance in case LeBron James leaves town this summer. Other than that, no team is calling to make a blockbuster offer for Rose or J.R. Smith. Barring an unforeseen blockbuster trade, this is the roster Cleveland will run out come postseason in attempt to land another Finals rematch with Golden State. It’s a roster Cavs players are vocally concerned about, and one which might not even get the chance to rematch the Warriors in the first place.